After a long long time, Microsoft is finally focusing on the Windows console. i.e, the command prompt and PowerShell and adding new customization options. Recently Microsoft added an awesome feature that lets you zoom in and zoom out in command prompt and PowerShell. Now, a few more new customization options have been arrived that lets you change cursor size, color, and shape in the command prompt and PowerShell. 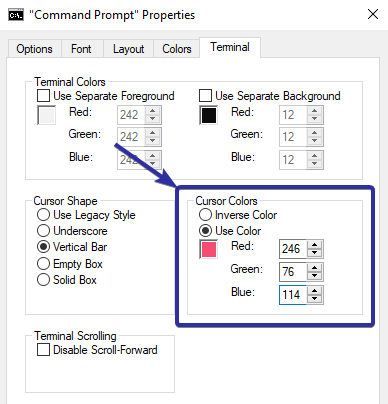 When you combine these new customization options with the existing background and font color options, you can create some interesting looking command prompt and PowerShell Windows. If you use the command prompt regularly, then these customization options will help you make the console window your own in terms of look and feel. 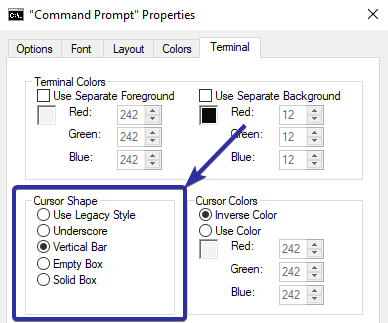 So, without ado, let me show you how to change command prompt or PowerShell's cursor size, cursor color, and cursor shape on Windows 10. Before getting started, all these customization options are only available in the newest builds. So, confirm that you are using Windows 10 build 18323 or higher or on Windows 10 version 1903. Search for command prompt or PowerShell in the start menu and open it. Right-click on the title bar and select "Properties". Under "Cursor Size" section select the size you want. That is it. You've successfully changed the command prompt or PowerShell cursor size. Go to the "Terminal" tab. Enter the RGB values of the color of your choice. To get the RGB values of your favorite color, use this web tool. That is it. You've changed the cursor color on the command prompt or PowerShell. That is it. As soon as you click on the "Ok" button, the changes are applied instantly and you will see in the new cursor shape in the command prompt or PowerShell window. 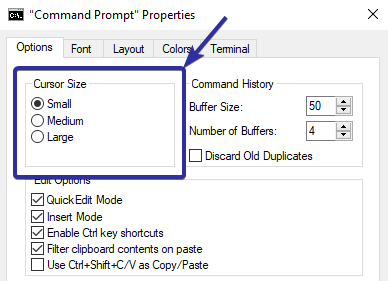 If you like to use the command prompt or PowerShell to get your work done, here are some things you can do using command prompt or PowerShell.